Independent South West brewer Bath Ales has a reason to celebrate, as the ten millionth bottle of their beer rolls off the line. 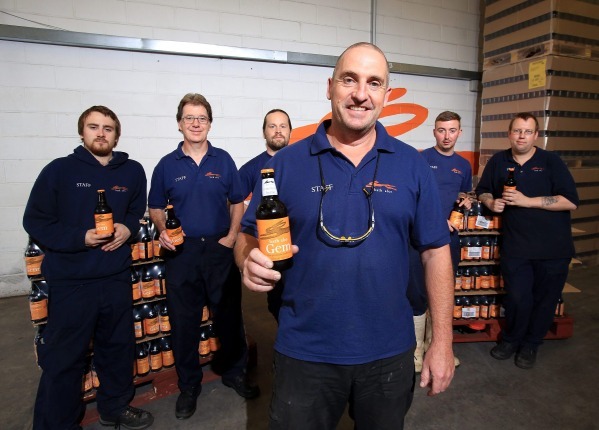 The brewer commissioned a state-of-the-art bottling plant at its Warmley premises in 2007 and has since bottled its own beers including flagship brew Gem, as well as beers from another 25 breweries nationwide. Bath Ales’ bottling plant currently produces around 65,000 (500ml and 330ml) bottles per week – nearly 3,500,000 a year – half for its own beer and the rest for other breweries. Craig Lewis, Bath Ales’ Production Director, comments: “This dramatic expansion in production gives us more options and more flexibility and looking ahead we hope it gives us the opportunity to increase what we can offer to drinkers. Bath Ales announced investment plans last autumn that included an expansion to larger premises and has just installed a new packaging machine at the bottling plant. This will enable the brewer to handle a larger variety of pack size combinations. A pilot boutique brewery is also nearing completion. The dedicated Quality Control team ensures that the quality of the incoming beer is of a high enough standard to be bottled and the increased activity has resulted in the appointment of a new apprentice at the bottling plant. The brewery recently took delivery of two new fermenting vessels to increase its brewing capacity by almost 40 per cent. It currently operates eight pubs in Bristol and Bath, including craft beer bar, Beerd and recently opened The Grapes in Oxford and Graze Bar, Brasserie and Chophouse in Cirencester. In total, the brewer employs over 200 people across the business.